The view from the One Liberty Observation Deck. Last year, One Liberty Observation Deck debuted Bar 57, the city's highest bar, on the 57th floor of One Liberty Place for a brief time. If you didn't get a chance to check it out last year, there's good news. Bar 57 will once again open this fall, on select Thursdays for happy hour from 6-9 p.m. The 21-plus crowd will be able to take in sweeping views of the city with a cocktail in hand on Sept. 21, Oct. 19 and Nov. 16. Update: The Dec. 14 event has been cancelled. Each Bar 57 event will feature cocktails made from Federal Distilling’s Stateside Urbancraft Vodka, a local craft distillery based in Kensington, and light fare. There will also be DJ entertainment. On Sept. 21, DJ Royale will spin tunes. 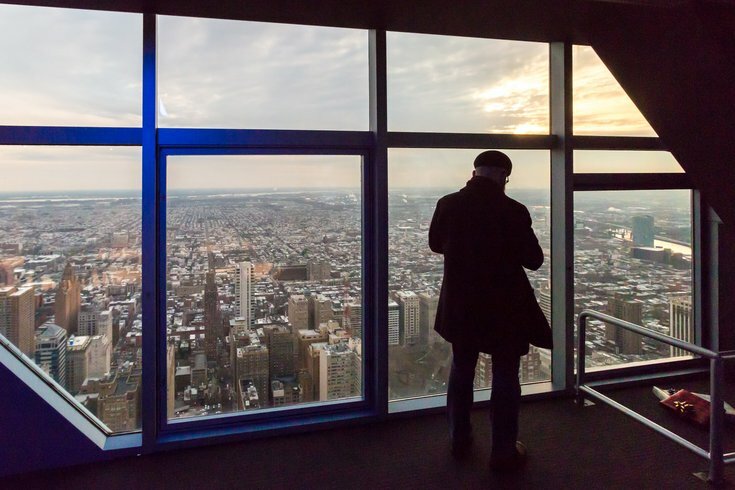 To attend Bar 57, guests are required to purchase regular admission tickets to One Liberty Observation Deck, which will be discounted during Bar 57 hours. Tickets are $14 at the door and $10 in advance online. Purchasing tickets ahead of time is encouraged. During the fall 2016 launch of Bar 57, tickets sold out, filling the 57th floor to capacity and catering to 275 people each week.